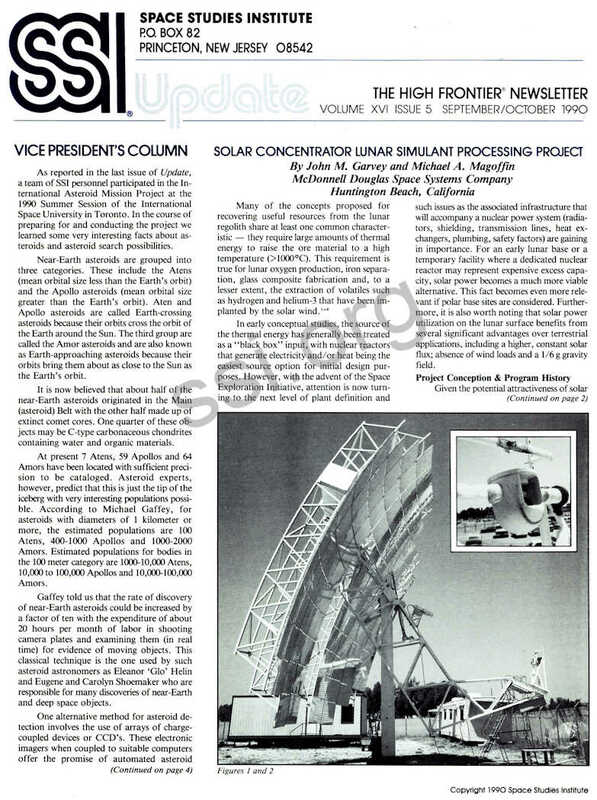 As reported in the last issue of Update, a team of SSI personnel participated in the International Asteroid Mission Project at the 1990 Summer Session of the International Space University in Toronto. In the course of preparing for and conducting the project we learned some very interesting facts about asteroids and asteroid search possibilities. Near-Earth asteroids are grouped into three categories. These include the Atens (mean orbital size less than the Earth’s orbit) and the Apollo asteroids (mean orbital size greater than the Earth’s orbit). Aten and Apollo asteroids are called Earth-crossing asteroids because their orbits cross the orbit of the Earth around the Sun. The third group are called the Amor asteroids and are also known as Earth-approaching asteroids because their orbits bring them about as close to the Sun as the Earth’s orbit. It is now believed that about half of the near-Earth asteroids originated in the Main (asteroid) Belt with the other half made up of extinct comet cores. One quarter of these objects may be C-type carbonaceous chondrites containing water and organic materials. At present 7 Atens, 59 Apollos and 64 Amors have been located with sufficient precision to be cataloged. Asteroid experts, however, predict that this is just the tip of the iceberg with very interesting populations possible. According to Michael Gaffey, for asteroids with diameters of 1 kilometer or more, the estimated populations are 100 Atens, 400-1000 Apollos and 1000-2000 Amors. Estimated populations for bodies in the 100 meter category are 1000-10,000 Atens, 10,000 to 100,000 Apollos and 10,000-100,000 Amors. Gaffey told us that the rate of discovery of near-Earth asteroids could be increased by a factor of ten with the expenditure of about 20 hours per month of labor in shooting camera plates and examining them (in real time) for evidence of moving objects. This classical technique is the one used by such asteroid astronomers as Eleanor ‘Glo’ Helin and Eugene and Carolyn Shoemaker who are responsible for many discoveries of near-Earth and deep space objects. One alternative method for asteroid detection involves the use of arrays of charge­coupled devices or CCD’s. These electronic imagers when coupled to suitable computers offer the promise of automated asteroid discoveries. The leading proponent of this technique is Tom Gehrels of the University of Arizona whose Spacewatch Camera Project uses CCD arrays. In fact many objects are detected which never get cataloged due to a lack of interest on the part of the astronomer whose photographic plates of deep space objects are “contaminated” by asteroid traces. 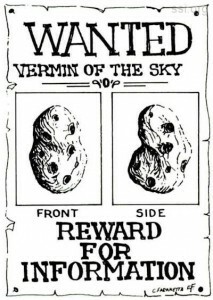 Some astronomers have referred to asteroids as “vermin of the sky.” It is critically important that initial indications of a new asteroid be followed up with additional observations immediately in order to determine the object’s orbital elements. Improving communications between astronomers regarding asteroids is one cost effective means of advancing our knowledge of these bodies. SSI Director Jim Burke of the technical staff of the Jet Propulsion Laboratory has applied for internal agency funding for just this purpose. Over the course of the summer project other low-cost ideas for increasing the asteroid location effort were discussed. 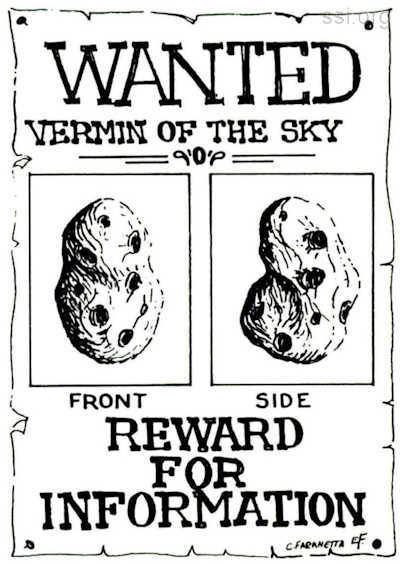 One novel concept is the idea of a small “bounty” or reward that would be paid to the first persons to detect and obtain the orbital elements of new asteroids. The students also focused on the need for improved asteroid search tools, particularly a telescope in space inside the Earth’s orbit around the Sun, to search for possible Earth­Sun Trojan asteroids. AJthough ground-based searches rule out Earth-Sun Trojan asteroids larger than approximately one kilometer in diameter, smaller asteroids would be extremely valuable. A carbonaceous chondrite with a 100 meter diameter, for example, has a mass of over a million tons of which perhaps one hundred thousand tons could be water. Once again it is clear that even modest “space prospecting” activity may have a profound effect upon space flight, solar system exploration and the human breakout into space. SSI’s role in the International Asteroid Mission is communicating this message to the world. In early conceptual studies, the source of the thermal energy has generally been treated as a “black box” input, with nuclear reactors that generate electricity and/or heat being the easiest source option for initial design purposes. However, with the advent of the Space Exploration Initiative, attention is now turning to the next level of plant definition and such issues as the associated infrastructure that will accompany a nuclear power system (radiators, shielding, transmission lines, heat exchangers, plumbing, safety factors) are gaining in importance. For an early lunar base or a temporary facility where a dedicated nuclear reactor may represent expensive excess capacity, solar power becomes a much more viable alternative. This fact becomes even more relevant if polar base sites are considered. Furthermore, it is also worth noting that solar power utilization on the lunar surface benefits from several significant advantages over terrestrial applications, including a higher, constant solar flux; absence of wind loads and a 1/6g gravity field. The basic project scope for the production of glass fiber with a prototype facility was formulated during the Space ’88 Conference in Albuquerque, New Mexico (August 1988). Gregg Maryniak of SSI, Brandt Goldsworthy of ALCOA/Goldsworthy Engineering and John Garvey of McDonnell Douglas outlined a project in which MDSSC would supply the use of a 75 kWth solar concentrator (Figure 1) plus any interface attachments, conduct component tests in their Space Simulation Lab and run the overall project. ALCOA/Goldsworthy Engineering (A/GE) would develop a crucible for containing the simulant, while SSI would provide various simulants, help expedite hardware issues when possible (i.e. – supply inexpensive components that might normally take months to procure by the larger organizations) and identify additional partners for future research. For early lunar bases, glass products will be far easier to develop than structures that incorporate metal. Additionally, because there is no water in the lunar regolith to contaminate the melt, the resulting glass will have much better strength properties than terrestrial equivalents. Over the next half year, engineers met several times at the MDSSC and A/GE facilities in California to refine the project. These discussions were accompanied by negotiations for a joint venture agreement (JVA) between the team members.6 This document specified the general areas of responsibilities and near-term project objectives. Key features included limited liability, and proprietary data protection. Furthermore, no money was to change hands. This JVA has probably had more operational significance for the MDSSC and A/GE participants because it solidifies their respective management’s attitudes concerning the legitimacy of this project and subsequent allocation of corporate funds. It is due for renewal and the updated objectives will reflect the direct results of current research. After establishing the joint venture agreement, A/GE designed, fabricated and, in late spring of this year, delivered the first melt crucible to McDonnell Douglas. MDSSC then conducted a series of component tests prior to attaching it to the concentrator for full-scale simulant melting. These tests began in May of 1990 and led to actual simulant melting in July. A summary discussion of results is presented below. Figure 1 depicts the critical hardware elements – the MDSSC concentrator and the A/GE crucible. 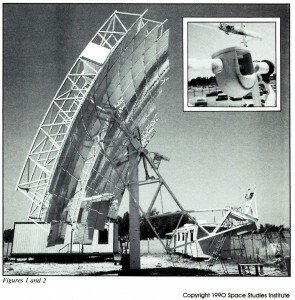 MDSSC developed the solar concentrator during the early 1980’s in an effort to produce an alternative energy system for remote applications in developing nations. A stirling-cycle engine converted the 75 kW of thermal power into 25 kW of electricity. However, the decline of oil prices eliminated the economical feasibility of the concept and two of the early production concentrators became test hardware at MDSSC’s facility in Huntington Beach, CA. These mirrors are clearly over-designed structurally for lunar applications, where, as mentioned previously, the environment is much more benign for solar power. Furthermore, there are good arguments for a solar “power tower” approach like the 10MW system in Barstow, California (another MDSSC project). Future research will address plant designs that are optimized for this lunar environment. However, for early tests, these 75kW concentrators are entirely acceptable. The A/GE crucible (Figure 2) was made from a high alumina, low cement castable with a maximum use temperature of 3000°F. Its key dimensions included a height of 27.3 cm (10.8 in.) and inner and outer diameters of 15.2 and 25.4 cm (6 and 10 in.) respectively. The bar, also supplied by A/GE, was initially recommended to be made from 96% alumina material. However, after discussions with alumina vendors, a consensus developed that such material may be susceptable to thermal shock.7 Silicon carbide was chosen as the material for the support bar because it is more tolerant to thermal shock at the expected operating solar fluxes (upward to 200 W/cm2) and has a maximum use temperature of 2900°F. Included in A/GE’s crucible design is a platinum/rhodium liner that would fit into the bottom of the device and hold the actual simulant material. This liner is still under development and as noted below, its absence has had a major impact on the early processing experiments. Delivery of the liner is expected in time for use in testing later during the summer. SSI has supplied a “non-beneficiated” simulant that resembles the lunar basalt found in the mare basins by the Apollo missions. Derived from a basalt deposit in Maryland, this simulant has been ground into a powder and is intended to be used only for these initial engineering tests. SSI is now procurring a more sophisticated simulant from the University of Minnesota that will be used when attention focuses on the actual products. This Minnesota Lunar Simulant will differ from the Maryland basalt in that it has glass elements comparable to the agglutinates found in actual lunar regolith.8 Such elements may impact the melt temperature and/or melt times needed for processing. Initial oven tests indicated that the lunar simulant has a melt temperature in the range of 1190°C (2200°F). Additionally, an oxidation process occurs several hundred degrees below this point. Subsequently, radiating graphite heaters were employed to simulated directed solar flux. Using such heat sources, it was found that the simulant fused at 90 W/cm2 of flux, well below the capacity of the solar concentrator, which can achieve up to 800 W/cm2. A parallel set of tests assessed the responses of the crucible and silicon-carbide support bar to flux exposures in the range of 90 – 100 W/cm2 The bar proved to be very robust, whereas the crucible showed some cracking due to the thermal shock. Consequently, to minimize this effect, an operational guideline was established that the crucible should be warmed up slowly at low flux levels when initiating full-scale testings. This objective is most easily implemented by starting experiments shortly after sunrise, when the solar flux is far below its maximum levels. Upon completing component-level studies, testing proceeded to the full-up concentrator/crucible configuration. With the crucible located several inches behind the focal point of the concentrator to reduce peak flux levels, a number of low-isolation-level tests were run with a small platinum cup filled with simulant placed at the bottom of the crucible. Such a cup was necessary since the planned platinum lining was not yet available and there were concerns that melted simulant might fuse with the alumina if there was direct contact between the two. This change impacted the simulant heating process, since now most of the input heat into the simulant/cup combination had to come via re-radiation from the crucible itself, whereas original plans called for direct concentrated solar flux to illuminate the top of the simulant, with additional conduction through the crucible lining into the sides of the sample. This alternative arrangement necessitated higher crucible temperatures, with a consequent reduction in crucible life. These tests demonstrated that extremely fine control of the flux beam on the crucible was possible. Also, it was observed that the temperature of the support bar rose more rapidly than that of the crucible and simulant. Subsequently, the bar was insulated and the temperature increase was moderated substantially. Initial short duration tests (less than twenty minutes) produced no change in the simulant. However, after running tests in the range of an hour, simulant temperature readings of 775°C (1450°F) were achieved and the color had changed from black to reddish brown – an indication of oxidation. * Concurrently, significant microcracking was observed in the crucible itself. In later tests, a number of modifications such as extended exposure durations were made to increase simulant temperature. Most notably, the small holding cup was removed and a larger quantity of simulant was placed into the crucible. The benefits of a large surface area for flux input were deemed to exceed the potential disadvantages of simulant bonding to the crucible walls. These changes resulted in successful melting of the top layer of simulant during early July and even the production of initial glass strands (Figure 3). The viscosity of the melted simulant was comparable to water. However, the front lip of the crucible underwent extensive degradation in these tests and is now near the end of its operational lifetime. A new crucible will be necessary to continue into glass product studies for the next phase of testing. These results validated the overall concept of using a solar concentrator to heat and melt lunar simulant. Michael Magoffin of McDonnell Douglas is currently documenting this test data in a project report.9 With the insights derived so far, a more efficient crucible for melting the simulant is under development. As an example of future improvements, ultimately a bushing will be incorporated into the crucible to enable controlled fiber production. Upon completing the demonstration of basic engineering principles (labeled phase 1), research will next focus on the glass products (phase 2). Also, a critical design tool – a detailed 3-dimensional thermal model of the crucible – will be completed (McDonnell Douglas initiated such a task in early 1990, but progress has been slow due to funding constraints). Eventually, a phase 3 activity would involve a prototype of the actual lunar surface facility. External funding will be a critical factor in enabling this last phase. Alternative project options are under consideration and there have been discussions with other organizations that have valuable experience in the areas of extraterrestrial resource utilization and/or solar energy technology. These include the NASA/University of Arizona Space Engineering Research Center, Washington University in St. Louis and L’Garde, Inc. On an international level, Shimizu Corporation, a leading Japanese architectural and engineering firm, has also shown interest in future involvement in this kind of activity. Conceivably, there may even be the potential of support from NASA (a request for proposal is already expected for similar conceptual studies of a lunar oxygen production plant). The joint effort by the Space Studies Institute, McDonnell Douglas and ALCOA/Goldsworthy Engineering represents an innovative approach from both a technological and programmatic perspective for developing the capabilities that will be required for lunar exploration. As with other SSI projects, it demonstrates that valuable space research can be initiated on relatively minor budgets. Using “off-the-shelf” hardware, this team has been able to conduct one of the first demonstrations of solar power utilization for processing simulated extraterrestrial material. Future work will focus on refining the engineering methods and developing candidate glass products. 1. Gibson, M.A. and Knudsen, C.W., “Lunar Oxygen Production from Ilmenite,” Proceedings from Space 88: Engineering, Construction, and Operations in Space, Albuquerque, NM (August 1988). 2. Briggs, R.A., Sacco, A., and White, S.T., “Feasibility Studies on Producing Iron From Ilmenite,” SS/ Upda1e, Vol. XVI, Issue I, March/ April 1990. 3. 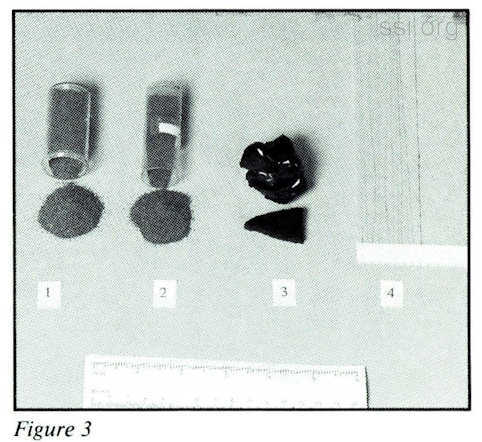 Goldsworthy, W.B., “Composites, Fibers and Matrices from Lunar Regolith,” SSI Upda1e, Vol. XI, Issue 5, September/October 1985. 4. Sviaroslavsky, I.N. and Jacobs, M., “Mobile Helium-3 Mining and Extraction System and Its Benefit Toward Lunar Base Self-Sufficiency,” Proceedings from Space 88: Engineering, Construction, and Operations in Space, Albuquerque, NM (August 1988). 5. Blacic, J.D., “Mechanical Properties of Lunar Materials Under Anhydrous, Hard Vacuum Conditions: Applications of Lunar Glass Structural Components,” Lunar Bases: Space Activity of the 21st Century, Edited by W.W. Mendell (1985). 6. 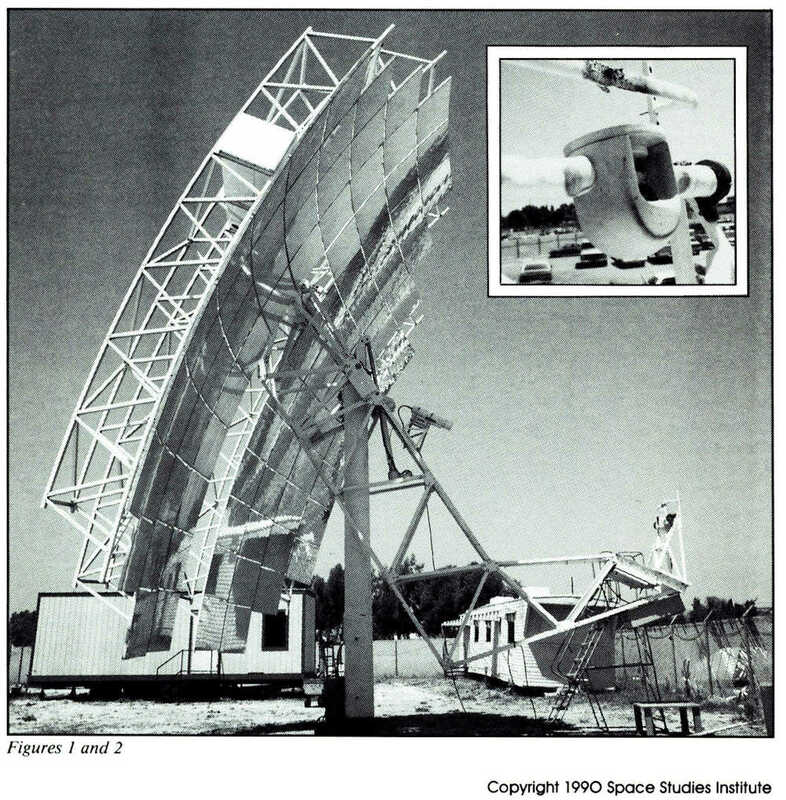 McDonnell Douglas Space Systems Co., Space Studies Institute, ALCOA/Goldsworthy Engineering, “Research Project Agreement for Solar Energy Applications in Lunar Simulant Demonstration,” 18 August 1989. 7. Gianutsos, C.R., Advance Ceramic Company ALCOA Technical Center-E. Internal Memo to D.J. Bray (April 12, 1990). 8. 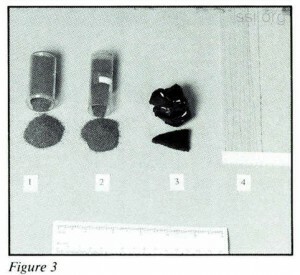 Weiblen, P.W., Murawa, M.J., and Reid, K.J., “Preparation of Simulants for Lunar Surface Materials,” Proceedings from Space 90: Engineering, Construction, and Operations in Space II, Albuquerque, NM (April, 1990). 9. Magoffin, M. A., “Lunar Simulant Processing Using Concentrated Solar Energy Test Plan/Results,” McDonnell Douglas report, IRAD 12-401, Huntington Beach, CA (fall, 1990). 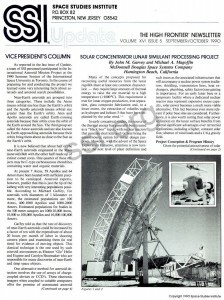 This note presents some initial results of a BFEC study of a concept for a lunar base and its possible relation to the Lunar Prospector (LP). The National Aeronautics and Space Administration (NASA) is currently studying scenarios of potential Lunar and Mars missions to better understand the resources and technology required to establish a permanent manned presence beyond Earth’s boundries. Among NASA’s studies are the assessment of infrastructure options to support the anticipated communications (both r.f. and optical), navigation and data system requirements for the proposed missions and bases. Recognizing atmospheric limitations of the current communication/navigation system of deep space probes, [i.e., the Deep Space Network (DSN) with sites in California, Spain, and Australia], NASA has reinitiated studies of a potential Deep Space Relay Satellite (DSRS). Such a DSRS placed in Earth orbit would relay communications between the deep space missions and an Earth site. 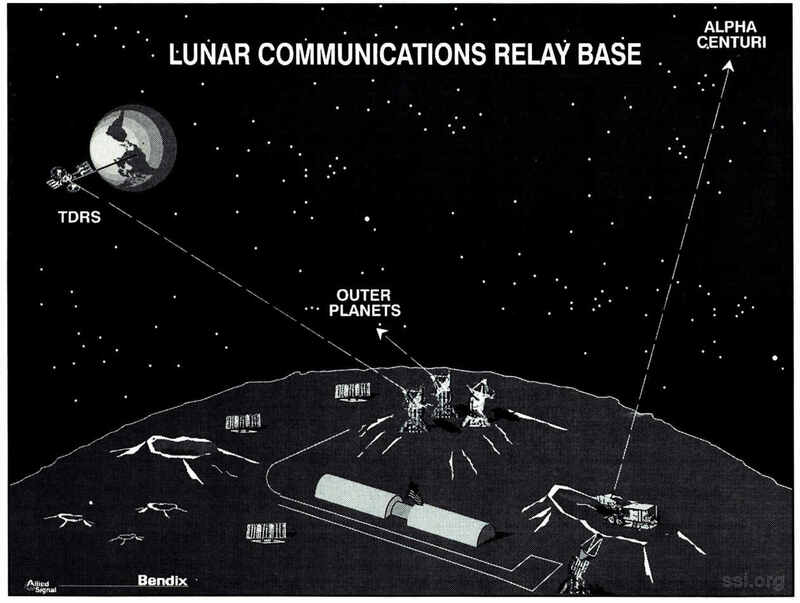 In a parallel activity, NASA is also studying extending the existing Tracking and Data Relay Satellite System, TDRSS, (currently used to communicate with low Earth orbiting satellites) to communicate with lunar bases and missions. A lunar relay station (manned or man-tended) could possibly have advantages over a man-made satellite in areas such as power availability, incremental system upgrading, and equipment maintenance. Additional advantages may come from the capability to erect numerous large structures (e.g. antenna & telescopes [for optical communications]) in the relatively weak lunar gravity. Perhaps the greatest advantage would come in a synergistic interaction with the other elements of a lunar base. For example, the antennas and telescopes could also be used for scientific studies. The discovery of volatiles at the lunar poles (as could be found by the LP) would enhance the establishment of a polar base. Correspondingly, a government decision to conduct a detailed feasability study of a polar base, part of whose function could be a communications relay, should involve examination of the polar regions for resources including volatiles. Any discovery of substantial resources at the pole coupled with a decision to use the lunar missions to directly build space infrastructure could lead to the establishment of a permanent polar base that could also be used as an extraterrestrial communications relay. The authors would like to thank C. Bacque and J. Gale for their support.